With elections looming over Uttar Pradesh horizon, recently (Nov 2011) UP Chief Minister Mayawati declared that her cabinet has approved the proposal to divide the UP state into four smaller states. She declared that only a dalit-OBC Chief Minister should be able to solve the problems of dalit-OBCs. There is also the talk of giving reservations to Muslims in UP. All this has created a huge turmoil in political circles. Amongst the politicians who have succeeded at a fast pace during last couple of decades, Mayawati, the associate of late Kanshiram may be amongst the foremost of them. While she inherited the movement built by Kanshiram, she also showed her mettle to come to capture the seat of power in the challenging arena of politics. Her Prime Ministerial ambitions at the moment are not very vocal, though immediately after her getting the absolute majority in the previous UP assembly elections she projected the same as a ‘dalit ki beti’as Prime Minster (Daughter of a dalit). Many a times she has been in the news for the wrong reasons, ‘Taj Corridor’ case, her lavish spending on Ambedkar park and getting numerous statues not only of the past dalit icons like Dr. Baba Saheb Ambedkar, and Kanshiram but her own-self during last few years, have hogged media attention. Her major point of self proclamation is that all this expenditure she is doing is for the sake of dalits. What do dalits need at this point of time and in what proportion is an issue to be debated in a serious manner. Of late she has been also talking of reservation on the economic criterion rather than the caste one, and from the point of view of electoral arithmetic she has been wooing the Brahmins, through ‘Brahmin Bhaichara’ Sammelans (Gatherings for brotherhood with Brahmins). Her major advisor has been Satish Mishra, who not only has succeeded in getting many of his close relatives to be given plum posts; but also a University has been named after his mother’s name. From her earlier slogan of Bahujan Samaj, she has tilted to the slogan of Sarvjan Samaj and from the shooing away of Brahmins and upper castes she has been aggressively campaigning to get them in her electoral fold. While she has undoubtedly given a sense of empowerment to dalit identity, identity assertions have really helped dalits live with better self respect and social dignity. While the atrocities against them have shown a down ward trend in UP, what is debatable is the equity issues, economic empowerment of dalits which have remained in the limbo despite her regime being in majority rule. How should a dalit leader handle power, what sort of equations are needed to balance between ‘equity issues’ and ‘identity issues’ is again a matter of delicate balance. Dalits in India have gone through a long and painful struggle to strive for equality and dignity. The most profound contribution of Baba Saheb Ambedkar, coming in the backdrop of Jotiba Phule laid the foundation of the movement of the down trodden. Ambedkar, the profound scholar contributed to all aspects of dalits’ social and political life. He led the struggles for rights of dalits, who till that time were deprived of education, were mostly landed slaves and were under the grip of clergy and kept on the margins of the society. Ambedkar led movements, Chavdar Talab, Kalaram Mandir and Manusmriti burning were the major rallying points for dalits. His formation of independent Labor Party, Schedule caste Federation and later the concept of Republican Party were the milestones in the organizing process of dalits. The concretization of Ambedkars’ values were actualized through his becoming the chairman of drafting committee of Indian Constitution. He tactfully handled many vexed issues related to overall efforts towards the social transformation of caste in particular. His major focus was: educate, organize and agitate for the rights of dalits. The later period was marked by few agitations and more of political activity. The remarkable ones’ amongst these were the land reform movement of Dada Saheb Gaikwad and later the formation of Dalit Panthers by dalit youths, on the lines of Black panthers of US. Most of these movements later got fragmented and the plight of dalit politics became abysmal with the ruling parties trying their best and succeeding in wooing one or the other dalit politician. The electoral confusions were another dimension of their alliances, some of them tilted towards Congress, while some of them had no compunctions in allying with avowed HIndutva parties hailing Hindu Rashtra openly, allying with the forces eulogizing Manusmiriti and Hindu nation. Mayawati at one time not only allied with BJP in UP to come to power but also went on to campaign for Narendra Modi in elections in the aftermath of Godhra-Gujarat carnage. Around the time when Dalit Panthers were agitating on the streets, Kanshiram began his political journey in a different way. His methods also ensured that the bane of dalit politics, ‘fragmentation into pieces’ of his movement will not take place. The dissenters were thrown out, and the dictates of the supreme leader, Kanshiram and later Mayawati prevailed. Kanshiram first started BAMCEF, which was an association of educated dalits, who believed in ‘pay back’ to the community. There understanding was that they have prospered due to the provision of reservations for dalits. They got jobs due to these provisions. From here the non-electoral DS4 (Dalit Shoshit Sangharsh Samiti) was formed. The focus for Kanshiram during all this period was cadre training and outlining the threat of Manuvaad, Brahmanvad the central threat to the interests of downtrodden. Later Kanshiram went in to form Bahujan Smaja Party and due course Maywati became his closest associate and she later succeeded him as Supreme leader once Kanshiram fell sick. The second major thrust of Kanshiram and later Mayawati was to come to power with whatever means and to try to implement their agenda. The focus on capturing political power, the foundation of trained cadres was the hallmark of Kanshiram, BSP. 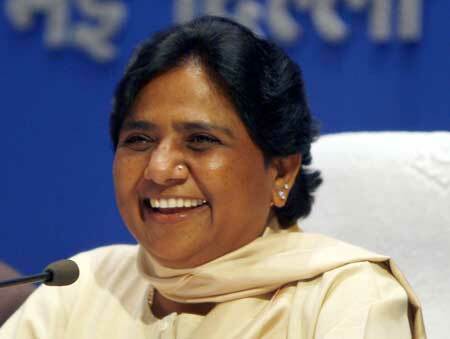 During the course of political journey of BSP, Mayawati kept on rising up on the electoral ladders in UP. She struck an alliance with RSS progeny BJP. Here two contrasting forces stood face to face, Mayawati for the rights of dalits and BJP for the long term goal of Hindu Rashtra, based on Brahmanism. This alliance was like Mayawati reversing the Ambedkar’s burning of Manusmriti and openly associating with the followers of Manu. Later with coming to political power on her own, she openly changed the track. Initial days in BSP meetings, the slogan was ‘Tialk Taraju aur Talwar, Ehko Maro Jute Char’ (Beat the upper caste) now it has been substituted by ‘Brahman Shankh Bajyega Hathi Badhta Jayega’ (Brahmin will lead: Followers of BSP will march). The Elephant, electoral slogan of BSP got recast, ‘Hathi Nahi Ganesh hai: Brahma Vishnu Mahesh hai’ (It is not elehant-Its Brahma-Vishnu-Mahesh: Hindu Gods). The political ambition of power has strange logic of its own. Mayawati’s spending millions on elephant statues, and the statues of her own self smacks of identity politics taken to absurd limits. One concedes that dalits do need a space in social sphere, these statues must be giving them sense of dignity and belonging. The question is how much public spending can be allocated to the statues and how much should be spent for social welfare of dalits has to be rethought. The dalit politics has come to new crossroads. The core issues of dalits remain far from being solved in any substantive way. The problems of poverty, health, employment need a serious struggle, in case they are to be addressed. Can power, coming to power in this fashion, be the panacea for dalit issues? What happens to the Ambedkar’s teachings of ‘educate, unite and struggle’ is what needs to be taken up by those leading the dalit movement at various levels. Can just coming to power be goal in itself, is the question.